He's packing his bags -- again. December 2012, when he turns 75, is the third scheduled retirement for Ratan Tata. And it's not just the board that feels that way. There were loud cries of support from shareholders at the Tata Steel AGM in August, held soon after the announcement that Tata Sons had created a panel to find Tata's successor. "We can't lose our ratan (jewel)," said one shareholder, while others asked him to stay on as chairman emeritus. 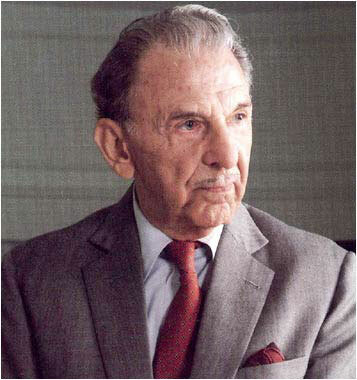 Ratan Tata was considered to have gained his position purely on the strength of his surname; he was incompetent, raged opponents both within and outside Bombay House, and he didn't possess an iota of the charisma of his uncle and predecessor, JRD Tata. 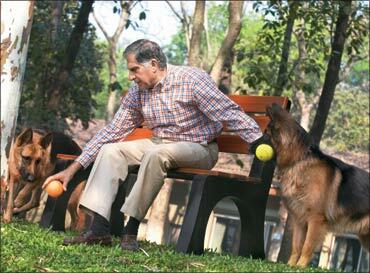 Image: Ratan Tata with his pet dogs. It is the largest Indian multinational conglomerate; more than 65% of the group's income comes from overseas and it has 98 operating companies (28 listed) spread across 56 countries in six continents. In the past decade -- the decade that marked the glorious years of Ratan Tata -- nearly $18 billion was shelled out to acquire 22 companies worldwide, including Tetley Tea and Corus Steel in the UK, New York's Pierre Hotel and Jaguar Land Rover. The Tata Group includes India's largest private steel company, the biggest auto manufacturer and the largest IT outsourcing firm. Not bad going for a man who was once likened to the clown in a circus (by his loudest detractor, Russi Mody). For Tata's successor -- whoever that turns out to be -- the bar's been raised sky high. "Tata's job is the most difficult one in the country today. Whoever runs the Tata Group has to provide strategic leadership, direction and inputs on multiple businesses, which is hugely challenging," says Rajeev Gupta, managing director of private equity firm Carlyle India. Not only will the heir have to ensure continuation of the group's growth momentum, but also provide the direction and vision for future growth. It's not an easy task. But then, nor was Tata's. Left to himself, Ratan Tata would probably have stayed on in the United States after training as an architect at Cornell University. 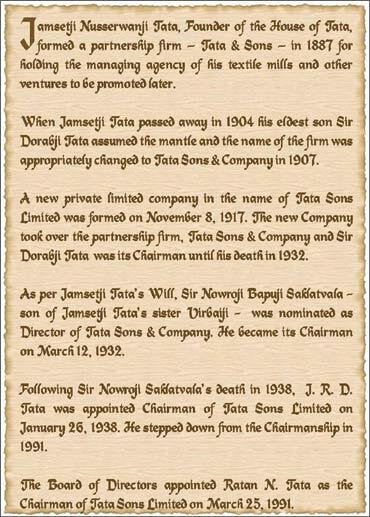 But the son of deputy group chairman Naval Tata and the nephew of JRD Tata couldn't be allowed to work outside the group (he had an offer from IBM). He got his first independent assignment less than a decade later -- as director of National Radio and Electronics (Nelco), in 1971 -- but it was a mixed blessing. Nelco was in dire straits when Ratan came on board -- losses of 40% and barely 2% share of the consumer electronics market. Ratan's next assignment was just as trouble-stricken. He was asked to turn around the sick Empress Mills. He did, but was refused the Rs 50 lakh (Rs 5 million) investment required to make the textile unit competitive. Empress Mills floundered and was finally closed in 1986 (by which time the infamous Mumbai textile workers' strike had also taken its toll). The two 'failures' haunted Ratan for decades. His track record was suspect, he was jinxed, said his baiters. "My first directorship was that of Nelco and the status of that company has forever been held against me. No one wanted to see that Nelco did become profitable, that it went from a 2% market share to a 25% market share," Tata said several years later. The attacks became more vicious after 1981, when JRD stepped down as Tata Industries chairman, naming Ratan his successor -- in one leap, Ratan had moved to the head of the queue for eventual leadership of the entire Tata Group, and that was completely unacceptable to many. So much so, that at one Tata Sons meeting, when Nelco's losses were being blamed on Ratan (although he came to the company much later), JRD had to step in and deflect the criticism. 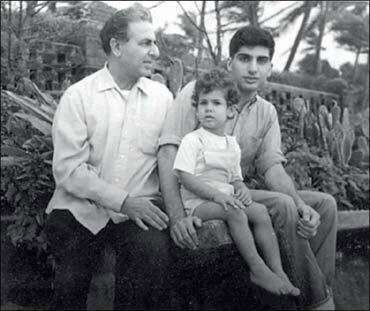 Image: Naval Tata, Ratan Tata and Noel Tata (in the centre). But even JRD's backing wasn't enough to help Ratan achieve many of his ambitions for the group. Foreseeing expansion of capital markets, which meant easier access to money for new projects, Ratan helped draw up a group strategic plan in 1983. But elsewhere in the group, his blueprint gathered cobwebs as companies -- many of which were run by their CEOs as independent fiefdoms under JRD's benevolent leadership -- blatantly ignored it or at best, paid lip service to the 1983 plan. Ratan's spell of bad luck continued -- even as his successes grew. He was steadily finding a place on the board of many group companies, having become a director at Tata Sons back in 1974. In 1988, he took over from Sumant Moolgaokar as Telco chairman -- and promptly found himself at the centre of a prolonged labour dispute, perhaps the worst industrial relations slide in Tata history. Ratan stood firm and eventually the matter was resolved in the company's favour. In an interview some years ago, Ratan recalled that Telco was "the first company in which I could actually do something. In other companies, I was always put in a fire-fighting situation." Taking over from JRD as group chairman in 1991 didn't resolve matters either, even though it was a Tata Sons board decision to make him group chairman. "Oh no, I wouldn't say that; that would mean the others did not have integrity," JRD replied. "I chose him because of his memory. Ratan will be more like me." It didn't help that they were more experienced and, many believed, more deserving than Ratan to head the group. Indeed, in an interview a few years ago, Ratan recalled his surprise on hearing of his appointment: he had thought Palkhivala and Mody to be neck-and-neck in the race for the top post. As it happened, Palkhivala's political views and Mody's clashes within the group worked against them. Mody, though, continued to be a thorn in the flesh of both JRD and Ratan. 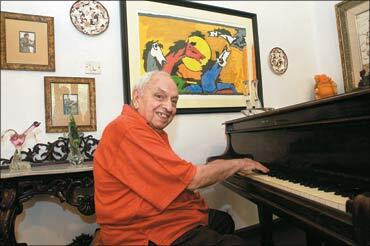 His battles with Ratan were loud, acrimonious and conducted in full public view, which went against the ethos of this low-key business house -- an inside joke at the time was that Russi Mody had become Rude-i Mody. JRD finally dismissed him in 1993. Ratan enforced the long-dormant retirement age rule for all business heads and directors, which effectively dealt with Seth and Kerkar (ill-health hastened Palkhivala's departure). To his credit, Tata didn't let the criticism and internecine battles deflect him from his chosen path. On taking over in 1991, he dusted off the 1983 plan and updated it, taking the newly-opened economy into account. That meant rationalising the Tata business structure. The remnants of the era of government controls combined with independent functioning of group companies in decades past could be seen in the way the group had grown till then -- unstructured, with overlapping business across multiple companies. 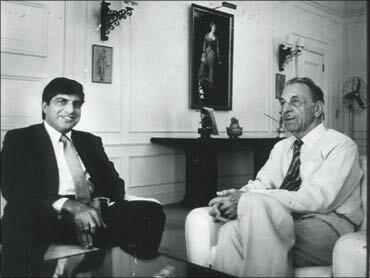 Image: Ratan Tata with J R D Tata. And Ratan was choosy about its use (stepmother Simone's cosmetics business, Lakme, which was later sold, and half-brother Noel's retail business didn't make the cut). Business historian and writer Gita Piramal has a different take on Ratan Tata's legacy. "Tata put 'design' into the group -- in mergers and acquisitions, engineering or cars or anything else. It is a very forward-looking strategy, putting new competency in very old companies," she says. Perhaps the secret of Ratan Tata's success lies in his ability to think big -- and small. While he guides the Tata Group to pick up the luxurious Pierre Hotel in New York, he's also driving the launch of the budget Ginger hotels in India. He has the ability to envisage an automotive business that encompasses diverse businesses such as the iconic Jaguar and Land Rover marques on the one hand, the world's cheapest car the Nano, on the other, and hardy, rough-road trucks sandwiched in between. In contrast, Ratan had the vision to foresee the direction the economy -- and policy -- was taking, consolidate the business accordingly, and embrace change to leap ahead. That explains why it still remains among the top three business groups in the country while many have fallen by the wayside -- or dropped in the rankings -- in the post-liberalisation era. Yet almost none of this change came at the cost of people or employee morale. Be it the fixing of a retirement age for various employees or the creation of a close-knit group that could meet the group's ambitions, Ratan created a nimble-footed organisation. It's no secret that the genesis of the Tata Group's blockbuster moves can be traced to him. Tata's first global venture -- the February 2000 purchase of Tetley -- had begun five years earlier when Ratan Tata made a $318 million bid for the tea company. That didn't work out, but Ratan didn't lose heart and kept an eye on the company's activities. The deal was finally clinched at $430 million. Sheer perseverance may have made that deal come true. The Corus deal is also a telling example. A close associate recalls Ratan calling Tata Steel MD B Muthuraman, who was on a trip to Hong Kong. "I've learnt that Corus is up for sale. Do you think we can look at it?" he asked. After some thought, Muthuraman replied that they could perhaps pick up a strategic stake. Image: Rata Tata as a flying enthusiast. Ratan had different plans. "We must buy that company. Think it over," he advised. The next morning, Muthuraman called Tata to say he was game. With no disrespect to Muthuraman and other leaders who have spearheaded the various companies in the group, it must be said that such gutsy deals can't be done without a strong group backing or reputation. Although the Anglo-Dutch company had several plants in the United Kingdom, there was little attempt to stop the deal by either political parties or trade unions. The Corus management was happy to support the deal, placing its faith in the group's reassurance that there would be no layoffs and that pension shortfalls would be taken care off. And even that was to be funded only through cash flows from Corus, with no recourse to Tata Steel -- a reflection of the credibility the group enjoyed in global financial markets. Tata's big deals are balanced by projects focusing on the lowest common denominator. In fact, Tata has been among the very few to perfectly understand the pysche and the needs of the Indian consumer -- and build successful businesses around those insights. That is, by recognising that the big market opportunity lies in making desirable products affordable for a larger audience and creating successful products to cater to a market need -- be it the passenger-car foray with the Indica in the early 1990s, the promise to create a Rs 1 lakh (Rs 100,000) car or for that matter, making water filters that don't need electricity (for rural areas). Hemendra Kothari, the doyen of investment banking in India who has worked on most Tata Group deals, has watched Tata's working style closely. "He is a very discerning person when it comes to decision-making. And once he has made up his mind, he is prepared to go all out to achieve his objective, be it Corus or Nano," he says. Still, the markets have usually considered Tata to be out of his depth, questioning -- and dismissing -- his big, bold moves as 'Ratan's follies'. The Indica was the first. People scoffed openly, when, in 1995, Tata spoke of building a passenger car with "the Zen's size, the Ambassador's internal dimensions and the price of a Maruti 800". The scepticism seemed justified as project costs escalated to Rs 1,700 crore (Rs 17 billion) and Tata Motors posted Rs 500 crore (Rs 5 billion) in losses -- the biggest splash of red in Indian balance-sheet history. "Even within Tatas, people kept asking me to distance myself from the project so that when it failed I wouldn't be stuck with the blame. And when I refused to do that, they distanced themselves from me," Tata said in an interview a few years ago. Ratan proved his detractors wrong, and how. Indica went on to become Tata Motors' great success story -- about a million units have been sold since its 1998 launch. The group's global ambitions were greeted with similar scepticism. The Corus deal would lead the group to bankruptcy, critics declared: investors dumped Tata Steel shares after the announcement, and the share price plunged 11%. And Tata was driving straight to disaster with the Jaguar-Land Rover deal: the brands were troubled, demand was low. Tata went on to prove everyone wrong. The group's international acquisitions are doing well, some have started making money. When Tata took over, less than 5% of the group's revenues came from overseas. As the self-consciousness eased, the confidence grew. And with it, the scale of ambition. 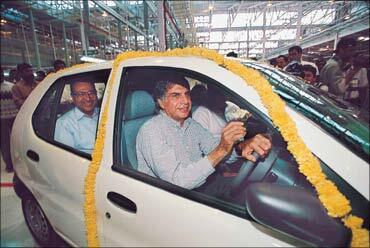 Image: Tata driving the Indica. The Ratan Tata of 15 years ago would never have gone for broke on deals like Corus and JLR. The JLR deal was audacious. Tata's interest was sparked as soon as the banks told the group that the marques were available. Why? According to him, "First, as Tata Motors in the number two SUV builder in India, owning [Land Rover] the gold standard of SUVs would be an enormous benefit to us. Second, to own a luxury brand with an immense history and heritage such as Jaguar is a virtually irresistible opportunity." There's a personal angle to the "immense history": Ratan's father Naval was one of five people in India who took delivery of a new Jaguar XK120 in the late 1940s. "I remember the XK with great nostalgia," Tata commented to a Jaguar team. "I particularly remember the instruments on the dashboard and how stylish they looked." Going by that logic, Ratan's 'follies' were decisions guided by prescience and not instinct and gut feel. Of course, he's not perfect. 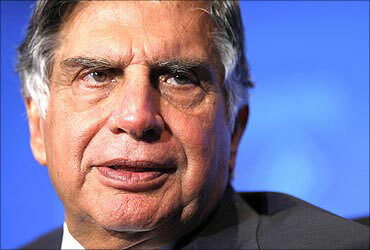 Ratan Tata personally, and the Tata Group in general, have been bogged down by their share of controversies. When it comes to the environment, especially, the group gets a "can do better" grade. In recent years, Tata Steel's joint venture with Larsen & Toubro to construct a port at Dhamra, Orissa, has come under the scanner for its proximity to two protected areas, one of which is the world's largest nesting site for the endangered Olive Ridley Turtle and the other India's second-largest mangrove forest. Tribal rights have also been a touchy subject. In 2006, several tribals were killed while protesting a wall being built by Tata Steel on land that was historically theirs. And Ratan Tata's pet Nano project was mired in controversy about land acquisition for the factory. After farmers in Singur, West Bengal, protested about forcible evictions and inadequate compensation, and Mamata Banerjee leapt into the fray, the Tatas pulled out of the state. The company shifted the factory to Sanand, Gujarat, but Ratan Tata's subsequent praise for controversial Gujarat Chief Minister Narendra Modi also drew criticism. It will be some months before even the shortlist for Ratan's successor is known. It's anybody's guess who will finally make the cut, but the qualities expected of this paragon are fairly clear to all. More recently, he also spelled out what the person doesn't need to be: a Tata, Parsi, or even Indian. "The successor should be the right person," was his emphasis at the Tata Chemicals AGM in August. 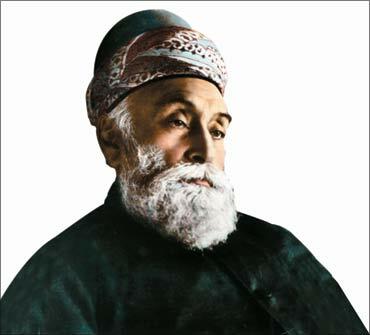 For the record, in its 142-year history, the Tata Group has had only five chairmen, all of whom were Parsis. The only non-Tata to make it to the top was Nowroji Saklatwala, who was chairman from 1932 to 1938. 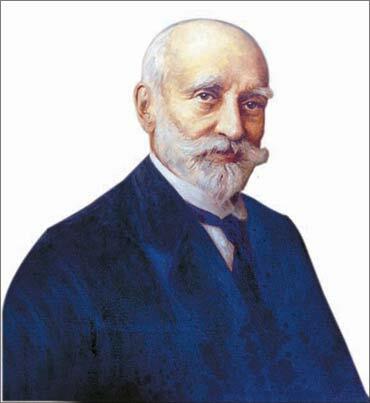 Of course, he was still family: Saklatwala was Jamsetji Tata's sister's son. Still, considering there aren't too many Tatas around anymore, perhaps it does make sense to keep an open mind about candidates from outside the family. But not outside the company, and certainly not outside the country, seems to be the majority opinion. 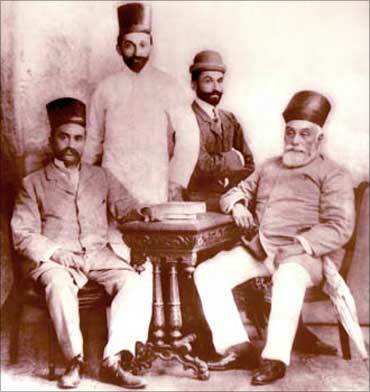 Image: J N Tata (R to L); Sir Dorabji Tata, Sir Ratan; and R D Tata, father of JRD Tata. Former Tata Steel CMD Russi Mody doesn't consider the lack of the right surname a handicap -- "I was a chairman although I wasn't a Tata," he says -- but is quite sure that only a company man will do for the job. 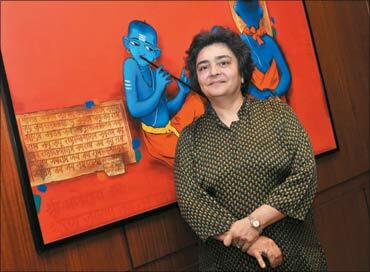 Preety Kumar, managing partner at global executive search firm Amrop, gives the neutral observer's viewpoint. "Internal succession always has smoother transition than an external one. In some of our work, successor appointments have been made two or three years before the succession, which helps change perceptions," she says. Sanjay Teli, MD of executive search firm ESP Consultants, adds that group acceptance of and support to the heir apparent is critical. "Ratan Tata's personality and the changes he brought about helped attract the best talent to the group. Retaining some of those people may become an issue in the future," he warns. Those and other important issues must be top of mind for the selection committee as it searches for the ideal candidate. The five-member panel -- comprising Tata Sons vice chairman NA Soonawala, group advisor Shirin Bharucha, British businessman Lord Bhattacharya, Tata Sons director Cyrus Mistry and Indian Hotels vice chairman R K Krishnakumar -- is expected to announce its choice by March 2011, which leaves room for a reasonably long handover period. The actual selection process isn't public, but it is known that Tata and other senior executives have given their inputs on what to look for. "It's a scientific process," says a person familiar with the broad workings of the panel. As it happens, those are precisely the qualities that catapulted B Muthuraman to the top job at Tata Steel in 2001. When J J Irani's retirement was imminent, three people were considered likely successors -- Muthuraman and T Mukherjee, both executive directors, and Firdose A Vandrewala, who was responsible for sales and marketing, as well as new business initiatives at the company. "Tata asked all three to prepare a presentation on the future of Tata Steel. Muthuraman's vision and roadmap was crisp, clear and the most appropriate," says a 30-year veteran of the company. Background and prior domain expertise aren't make-or-break criteria for Ratan Tata, perhaps because he's living proof that track records can be deceptive or misinterpreted. Anil Sardana was CEO of North Delhi Power when he was picked to lead Tata Teleservices (TTSL), a different industry altogether. He's already proved that the group's confidence in him was justified: from a user base of 15 million in August 2007 when he took over, TTSL now has 75 million. In many ways, the successor's task will be easier than Ratan's. It begins with the selection process itself. When Ratan took over from JRD, it was a succession fraught with intrigue, suspense and bad blood. Resentment from established camps within the group at what was seen as an arbitrary decision was only compounded by Ratan's own admission of surprise at the announcement. The ongoing selection process may be equally opaque -- at least, at present -- but there is some logic and purpose behind it, which should make the panel's decision easier to accept. The new chairman is also not likely to be battling cliques and fiefdoms within the group -- his predecessor has already taken care of that. Instead of the "corporate commonwealth" that Ratan inherited, the Tata Group now operates more or less as a cohesive unit, which will work to the successor's advantage. Besides, there is now frequent churn at the board-level as senior members attain retirement age -- most Tata Sons board members are nearing 75, when non-executive directors have to retire. The heads of the three biggest companies in the group also retired last year: there's fresh blood at the top at Tata Motors, Tata Steel and Tata Consultancy Services. 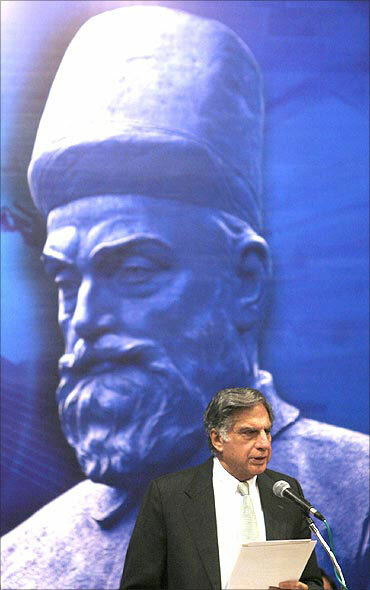 Also, when Ratan took over, the Tata family had neither financial nor managerial control over many group companies. Indeed, at one point in the 1980s, the Birlas owned more stock in Tisco than the Tatas (through Tata Sons) did. That vulnerability to outside interference is now greatly reduced: Tata Sons' holding in most group companies is now around 26%, sometimes more. Clearly, the old order has changed. But some things will remain constant -- Tata stepped into the shoes of a giant in 1991. His successor will do likewise. From driving cars to flying choppers, from charity to business strategy, Ratan Tata does it all, and he does it passionately. But, despite being the cynosure of all eyes, very little is known about the Tata Sons chairman's personal life. It's anybody's guess what Tata will do after he steps down from the country's top private sector job. Those who know him well believe he will indulge in all his pet interests, things he didn't have enough time for while helming the Tata Group. Now he'll have time to spend with his cars, as well as his other mechanical passion, planes. Like his predecessor and uncle JRD Tata, Ratan is an accomplished pilot and flies both planes and helicopters. 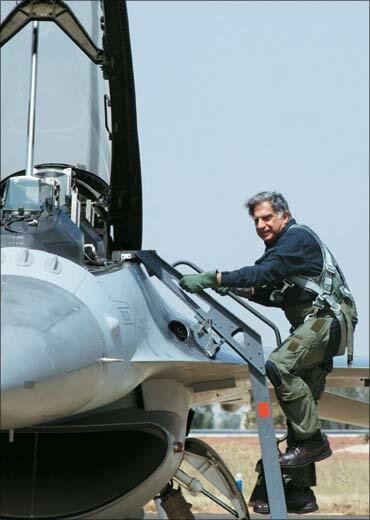 Image: Ratan Tata getting on to the Falcon F18. "I've got a type rating [a licence that allows the holder to fly specific aircraft] for the Falcon business jet, but lately I've been getting more into flying helicopters. I love the engineering in them and they're challenging to fly well," he says. There's also likely to be more time for swimming and golf, post 2012. Tata used to scuba dive regularly, but punctured his eardrums "too many times". He's had to give that up, but still swims "a lot". 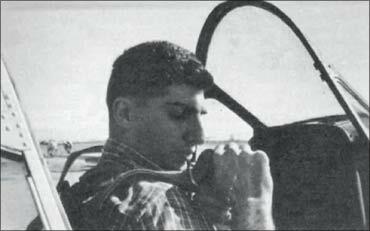 Ratan Tata grew up in the lap of luxury -- in the south Mumbai mansion that now houses Deutsche Bank, driven to school in a Rolls Royce. All that was forgotten in the decade he spent in the US studying architecture at Cornell, taking on odd jobs -- including washing dishes -- to supplement the pittance that the Reserve Bank of India allowed as foreign exchange allowance. Returning to India and joining the Tata Group didn't mean any substantial improvement in his standard of living. Ratan's first jobs were on the Tata Steel shop floor in Jamshedpur, where he is believed to have done all manner of tasks, including shovelling coal into the furnace. Which is perhaps why he retains the common touch, and focusses on innovations that will make the lives of ordinary people easier. 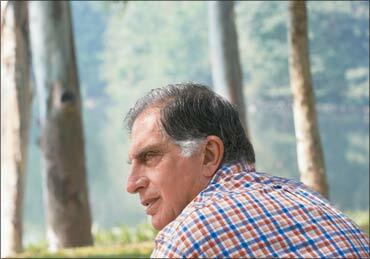 Although Ratan Tata will retire in 2012, he will continue to be associated closely with the Tata Group -- nearly 60% of the group holding company is controlled by two charitable trusts, the Sir Dorabji Trust and the Sir Ratan Tata Trust. Tata heads both. That will mean that not only will he get the chance to sit in the audience during group company AGMs and ask questions (as he said he'd like to do), he will also be able to carry on the Tata family tradition of philanthropy.